Microsoft today is announcing updates to its NFL app for the Xbox One console that will give fans a better sense of what’s happening at games in real life. Meanwhile, on the sidelines, Microsoft said today that it’s outfitting NFL coaches and players with new Surface Pro 3 tablets to replace the Surface Pro 2’s they were using before. Microsoft is talking today about what’s possible with specific devices, but really the company is thinking more universally than that. “We are building a Windows 10 app that is designed to be the best companion for NFL games,” Microsoft executive producer Todd Stevens told VentureBeat in an interview at Microsoft’s Loft One facility in San Francisco this week. For Microsoft, the NFL represents an opportunity to demonstrate how technology — both hardware and software — can provide better experiences for both sports consumers and professionals. This is a big year for NFL — in February 2016 the league will hold its 50th annual Super Bowl — and Microsoft is taking the season seriously with the 2015 season coming up. Xbox and Surface have both remained important to Microsoft through multiple corporate shifts, and now Microsoft can point to this app as an example of what’s possible across devices with Windows 10, which is now available. Not that the tech company has ignored the NFL all this time. In recent years Microsoft has brought together fantasy and reality in its NFL app and figured out how the Surface can help teams track players’ concussions. Microsoft has now gone further. Perhaps the most fascinating aspect of the revamped Xbox One NFL app, available starting in late August, is its dependence on real-time data. Every player in every game this season will be wearing a pad containing a computer chip connected to sensors. Every NFL stadium now features equipment to be able to track the data. The presence of all this technology means that onscreen, people will be able to see where players are, how far they travel during each play, and how fast they move. NFL calls this Next Generation Stats — or Next Gen Stats for short. Last season a few game broadcasts included data from the chips, but fans weren’t able to do everything they can do inside the new app. Now, in the refreshed app, they’ll be able to check out performance of players in specific highlight clips from games. “For the first time, NFL fans almost act like coaches and analyze plays like a coach would,” Stevens said. 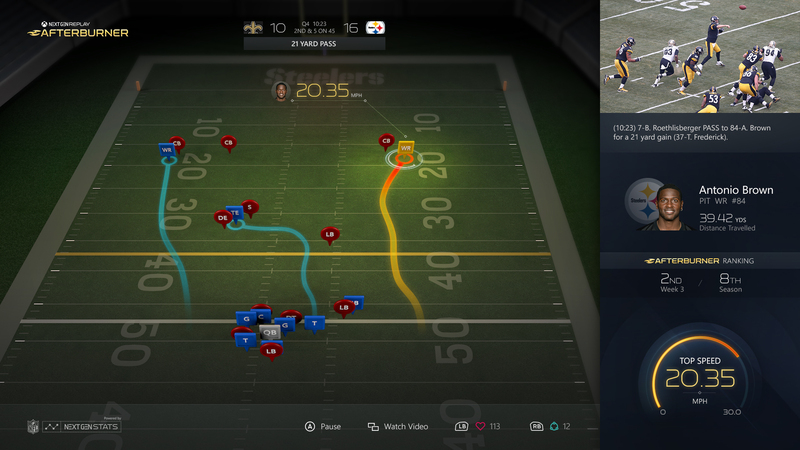 Above: Next Gen Stats in the NFL app for Xbox One. 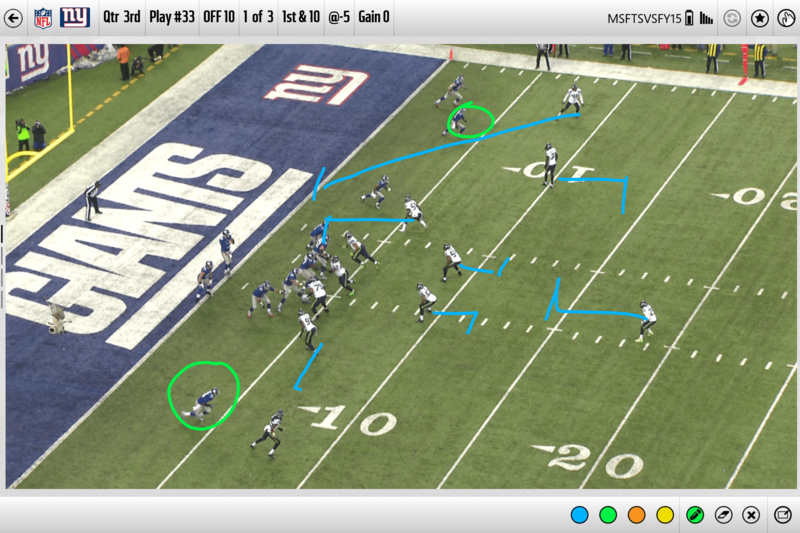 The data makes it possible for the app to recreate plays with colorful lines and arrows. Microsoft didn’t stop there. It went and created a competition with the new data called Next Gen Stats Pick’em. Each week, fans will be able to answer a few questions, like which player ran fastest. There will be a big prize — a ticket to the Super Bowl — for the person who proves to be the best at Pick’em. And every time a fan answers a Pick’em question, they enter a sweepstakes, for prizes such as a signed helmet. The app also offers a greater degree of personalization than it did before. You have to name your favorite team the first time you use it, and from there you can easily get to the videos involving that team. You can “like” videos and thereby develop customized video playlists. You can share videos with others on Xbox Live, too. Altogether, Stevens is very excited about how the new NFL app will be received. “This feels like Madden to fans,” he said. But fans aren’t the only ones who are in for a treat this year. On the field, coaches, players, and even referees will enjoy the benefits of a device that’s better suited to its environment. The Surface Pro 3 has a larger screen than the Surface Pro 2, so more video clips will be immediately visible to quickly choose from. It’s lighter, more rugged, and able to tolerate being dunked in water or Gatorade. The Surface Pen can make notes even when the screen is wet — “unlike any other tablet on the market,” Jeff Tran, director of sports marketing and alliances in Microsoft’s Windows and Devices Group, told VentureBeat as he showed off the device at Loft One. Above: The Sideline Viewing System for NFL teams on the Surface Pro 3. With the Surface Pro 3, coaches can annotate on plays and draw on virtual whiteboards in multiple colors, not just yellow. Clearer diagrams could help teams save seconds, Tran said, and seconds count in a game like football. Referees can use the new tablets to watch and zoom in on instant replays. It’s better than watching on a big screen television, Tran said, because referees can examine plays more carefully and thereby make more accurate decisions, Tran said. Microsoft does not currently have plans to make this Sideline Viewing System available to consumers, Tran said. But Microsoft is developing other cool technology for fans.